PHONE NUMBERS OF ALL YOUR FRIENDS are now on Facebook! No joke - go to the top right of the screen, click on Account, then click on Edit Friends, go left on the screen and click on Contacts. All phone numbers are published. Please repost this on your Status, so your friends can remove their numbers and thus prevent abuse. The only place I know where you can remove your phone number is in Profile (top right), Info (lefthand menu). Contact information is the last section on this page. You can delete your phone number from there. I think this is activated when you opt for getting updates and password retrieval via mobile phone. If you can do away with the said features, then by all means remove your phone number. The system does not state that your number will be shared to your contacts, nor is there a way for you to make this visible only to select people. 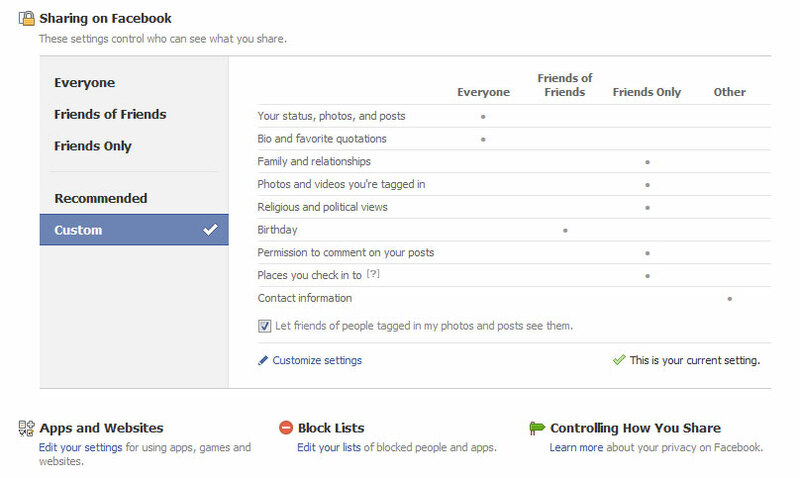 Visit your privacy settings to control who can see the information on your profile. Click on that and you get to the privacy settings. Note that "Contact Information" is set to "other". I tried to see what this exactly meant and change it if possible by clicking on "customize settings", and there is no option for "Contact Information". I'd think that this bit of information should be configurable, and is definitely more important, than your birthday info, whose privacy option can be set!